This week has been full of ’em. The next night, I had lawn-mower-night-from-hell. It is absolutely impossible to keep up with the yard right now. It would be hard if we lived on a hill. However, we live in a flat, poorly-drained area. I had a small window of opportunity to do a little mowing. I arrived home after a Chamber of Commerce meeting, which was after work, with no one home, no one to make supper for – well besides feeding the animals, of course. After chores, I started the Marla MacGyver show (Lawn Mower Episode). Another of my awesome friends likes to see me in MacGyver/Farm Girl mode…. she would have delighted in this episode. First of all … no gas in the mower or tank. Fine. Made a trip to town for gas. Gassed up mower, started to mow – mulching-mower did not like the tall, thick, wet grass. Decided to fire up the “Beast” mower. However, it was on the trailer with a flat. Fine. I aired up the tire, gassed up the mower, fought with (and won) the ratchet straps. Side note: ratchet straps make me crazy!! I didn’t want to mess with unhooking the tilt-trailer from the truck, so I drug out the ramps and set them up at the end of the trailer. The mower wouldn’t start. Fine. I finagled the choke – it is not a normal choke. It is an improvised, rigged-up choke. I got it started. Now … keep in mind I am used to running the other mower and all the pedals and levers are different!! I turned to monitor my alignment with the ramps, pushed the gas and almost flew off the front of the trailer. Ooops. THIS mower has a gear shifty thing that must be manually moved to reverse … not done by pedal like the other mower. Took a few deep breaths to calm heart beat. Once again turned to watch my descent on the ramps … ramp started to slide, but I was close enough to earth that we made it with just a small bump. FINALLY ready to mow. Too wet near the barn lot … almost got stuck in the first round of mowing. Back-n-forth, back-n-forth – made it out of that predicament by throwing a little mud. Mowed along, heard a clunkity-clunk – What the hooey was that? Ewww… bird carcass …. No time to mourn – hurry, hurry. Had more issues with that darn Forward/Reverse lever and smacked my arm/elbow on the old, wooden wagon in the front yard. No blood; kept mowing. Knew that MacGyver-loving friend was picking me up to walk at 8 p.m. Checked the time – decided to call it quits and start the pick-up process of all the ramps, gas can, air compressor, etc. The walk with my friend was so relaxing. 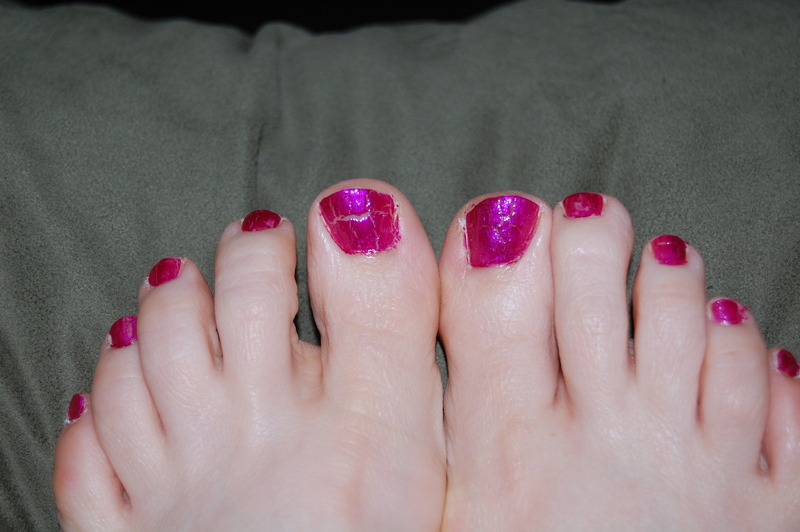 So, the next night I decided to pay a little attention to my toes and apply the new polish I bought. A little Magenta Mirage would be so cute! After the first couple of swipes … I thought it looked funny. A little more and I decided I had bought expired polish. It just was not looking right. I didn’t have time to take it off, so I tried to smooth it, but it didn’t want to smooth. I finally just hoped the clear, top-coat would help and I went on my merry way to town for dinner with kids and friends. I studied my toes after that. Awful! Then, my dim bulb started to brighten … I had purchased the nail polish that is supposed to crackle! I had antiqued my toes! I asked myself … why can’t I just kill time like a normal person and watch tv??? This entry was posted in Country Living, Exercise and Motivation, Friends and Family, Parenting, Work/Career and tagged Country life, friends, lawn mowing, MacGyver, mowers, old wagon, pedicure, Senior Awards night, sons, stupid things I do. Bookmark the permalink. Antiqued toenails – that’s hilarious and sounds like something I would accidentally buy too. There should be a really big sign or picture by items like that! 😉 Glad to know I’m not the only one that might make the mistake. And fyi on the crackle nail polish….my daughter looked at your picture and said that you’re supposed to paint white or black as the base coat and then use the crackle polish. Google ‘crackle toe nails’ for some pics. Hahahahaha. I don’t know what I would do without a 13-year-old to help me navigate the world of beauty products. I didn’t even know it even existed. They really should put a picture or big sign by products that are “new” or for the 13-year olds! I saw that polish. I figured that’s just what I need, as I tend to smudge/stain/chip it in no time, anyway. Glad you weren’t hurt with your fall and portrayal of McGyver. I hadn’t thought about that benefit of the polish! Thanks for reading and commenting. Gasp!!! You are soooooo living my life! Especially with the mowing. If I’m not clogging the blades with chocolate mint roots, I’m running over my sidewalk…shaving off concrete in the process. I have such a Lucy-Ricardo-life that it isn’t funny. Or maybe it is.